Below you will find specific and common information on how travel to Guanajuato, types of accommodations, getting around town, currency and communications. Please make sure you are familiar with what you need to enter Mexico from the Mexican Customs Office. Quick Note: There are basically two options for location of accommodations: in the colonial center of town, or outside of town in the surrounding hills. They both have advantages. Many of the larger hotels are outside El Centro. Some have pools, other have views, and some are located in old haciendas or mansions. Most of the "in-town" hotels are smaller and adapt to thier historical buildings making for a unique experience. Guanajuato does not have an international airport. Flights arrive at Bajío International Airport (MID) in León daily. The airport is 25 miles (40 kms.) northwest of the city. The airport is modern and has several shops, restaurants, bars, and rental car agencies. From the airport, taxis ($20 range) are available to Guanajuato. Most major rental car companies have airport counters. Guanajuato can be reached by driving from Mexico City (5 hours) on Hwy. 57 to Queretaro, then Hwy. 45 to Guanajuato. If you do drive your vehicle to Guanajuato, you must have Mexican auto insurance, it's the law. Please look under the Travel & Lodging directory for a list of companies. The first and second class bus terminal can be found 3 Km. west of "El Centro" which also happens to be the name of the bus that will take you downtown. To return to the bus station, take the bus marked "Central de Autobuses" from Plaza de la Paz. Bus fare is minimal. You can also take a taxi either way. Price is in the 20 peso range. Guanajuato is in the Central Time Zone and does observe daylight savings time. Businesses are open throughout the day. Since Guanajuato doesn't really have slow season (except in the hottest months of July-August), the traditional siesta isn't usually observed except in some of the small towns outside the capital. Siesta or the mid-day break is a tradition that reflects not only the necessity of avoiding heat-related fatigue, but is also a traditional time to spend with family, eat the meal of the day and recharge the batteries so to speak. You can call (direct dialing) and fax to anywhere in the world from Guanajuato, using the facilities at your hotel or at Larga Distancia office. You can purchase prepaid phone cards throughout town. 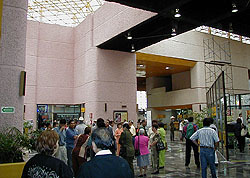 Internet access is available throughout Guanajuato's center in "cyber cafes", some hotels may offer the service.